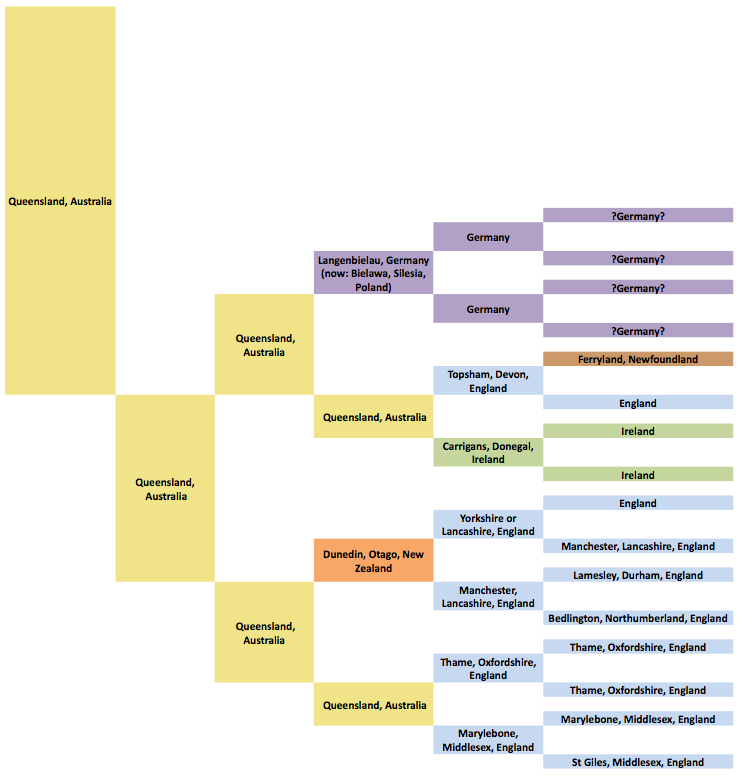 A flurry of posts appeared over the last day or two on the Australian Local & Family History Bloggers FB page where a number of genie-bloggers have been playing around with spreadsheets mapping out the locations of where their families were born. If you want to have a go yourself, GeniAus has posted some instructions on her blog. 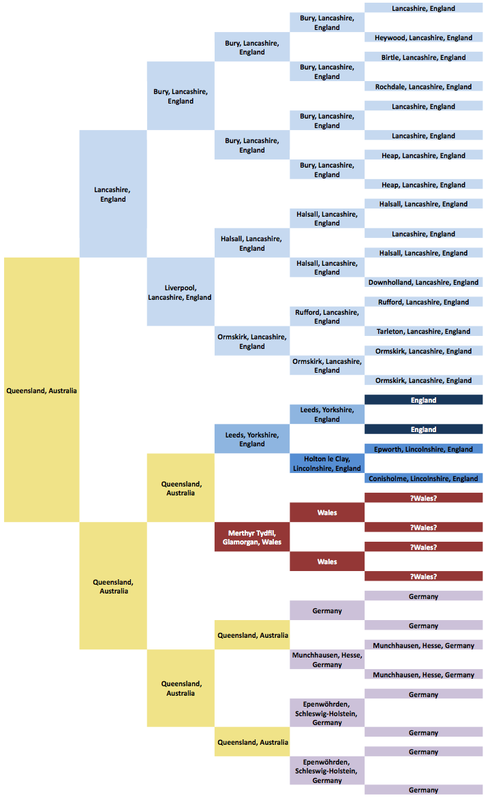 I couldn’t miss out on the fun, so here is my take on a Location Pedigree Chart. I decided to do one for my family tree and one for my husband’s – at least for his mother’s line. I’m only researching this half of his tree as someone else in his family is doing his father’s line. The first thing you may notice is that, even with just half a tree, my husband’s family is so much more interesting than my boring tree. I reckon his family were all born with itchy feet because they seem to be constantly on the move. The second thing you may notice is that in my tree I am a Lancashire Lass through and through on my Dad’s side of the family. Thank goodness for the excellent quality and quantity of Lancashire records online, especially the Online Parish Clerks for Lancashire! As you can imagine, just about every occupation in the weaving industry is covered by my ancestors in my father’s tree. This entry was posted in Genealogy and tagged Chart, Family History, Location, Organisation. Bookmark the permalink. 2 Responses to Location, Location, Location! Thanks for the mention – It was fun. I’m keen to do charts for my grandchildren as they seem to be interested in these graphic representations. No worries. I found it to be a useful exercise because until it was all laid out, I hadn’t realised that my father’s side hasn’t strayed from Lancashire in generations.